it is not possible to say. the posthumous name was "The Second Sage Duke of Zou"
carved in the Mencius ancestral temple in Zoucheng. Mencius (Chinese 孟子, transliterated Meng Zi, most accepted dates: 371 – 289 B.C.E. ; other possible dates: 385 – 303/302 B.C.E.) was a Chinese philosopher and follower of Confucianism who argued that humans are naturally moral beings but are corrupted by society. In the history of Confucianism, he is second only to Confucius in terms of his influence, as he was the primary proponent (and systematizer) of Confucian thought and values in the century following the Sage's death. His vision was accepted as the orthodox transmission of the Confucian Dao by the Neo-Confucians, earning him a place of primacy from the eighth century C.E. to the present day. He is often compared to Plato, as both were systematic thinkers who transmitted their sagely idol's teachings through dialogues. 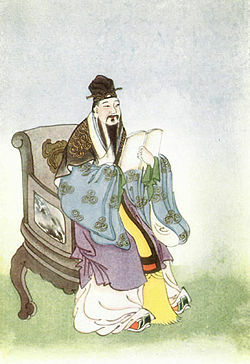 The teachings of Mencius have been preserved in an eponymous text, the Mencius (also spelled Mengzi or Meng-tzu). This book, likely compiled in the years following his death, contains transcriptions (or more likely recollections) of his teaching sessions, philosophical debates and conversations with kings. In contrast with the Analects of Confucius (Lunyu), which is comprised of short, rather epigrammatic phrases, much of the Mencius consists of long dialogues, written in prose and using many analogies and stories to illuminate his points. Your resolution is the commander of the qi. Qi is that which fills up the body. When your resolution is fixed somewhere, the qi sets up camp there. Hence, it is said, "Maintain your resolution. Do not injure the qi" (Mencius 2A:2. See also 6A:8). This is also the case with his mentions of Heaven (Tian) and the Way (Dao). However, this should not be seen as a criticism of Mencius's scholarship, as these terms were used by virtually all the classical philosophers in a mutually consistent (and similarly undefined) way. Though he did not develop a metaphysical grounding for Confucian discourse, it should be noted that Mencius made another equally valuable contribution through his systematization and expansion of Confucian teachings into an detailed, idealistic ethical framework. Mencius made two immeasurably-influential contributions to the Confucian worldview through his advocacy of two related concepts: the innate goodness of individuals and the ability of those individuals to reach sagehood through the cultivation of this virtue ("extending the good"). The reason why I say that humans all have hearts that are not unfeeling towards others is this. Suppose someone suddenly saw a child about to fall into a well: everyone in such a situation would have a feeling of alarm and compassion – not because one sought to get in good with the child's parents, not because one wanted fame among their neighbors and friends, and not because one would dislike the sound of the child's cries. From this we can see that if one is without the heart of compassion, one is not a human (Mencius, 2A:6). As for [people's] qing 情 [essence], "what they genuinely are," they can become good. This is what I mean by calling their natures good. As for their becoming not good, this is not the fault of their potential. Humans all have the heart of compassion. Humans all have the heart of disdain. Humans all have the heart of respect. Humans all have the heart of approval and disapproval. The heart of compassion is benevolence. The heart of disdain is righteousness. The heart of respect is propriety. The heart of approval and disapproval is wisdom. Benevolence, righteousness, propriety, and wisdom are not welded to us externally. We inherently have them. It is simply that we do not concentrate upon them. Hence, it is said, "Seek it and you will get it. Abandon it and you will lose it" (Mencius 6A:6). This passage was a direct challenge to other philosophers of the day (specifically Moists and followers of Yang Zhu) who argued that Confucian moral cultivation went against the basics of human nature. By arguing for the innate virtue of human beings, Mencius moralized human discourse, as every individual (from the peasantry to the gentry) becomes valorized and equalized by their shared moral potentiality. At the same time, this also made moral cultivation a personal responsibility, as no one was inherently seen to lack the potential for sagehood. Another intriguing element of this system can be in the Mencian description of righteousness and propriety as innate virtues. These two terms refer to the mental attitudes that support and underlie the Confucian Five Relationships – righteousness, which encourages an individual to be appropriately deferential towards their parents and elders, and propriety, which encourages the proper observance of the rules of etiquette. Mencius's view that these were both in-born potentialities demonstrates how central these beliefs and attitudes were thought to be in the classical Chinese definition of human nature. However, Mencius did not blindly argue for the actual goodness of people, as he openly acknowledged the evil and selfishness in the world. Instead, he suggested that that it was society's influence – its lack of a positive cultivating environment – that caused bad moral character (discussed below). As a result, it was the responsibility of each individual to cultivate the "sprouts" of their morality (a common Mencian theme), "extending the good" that they were each born with. Among babes in arms there is none that does not know how to love its parents. When they grow older, there is none that does not know to respect its elder brother. Treating one's parents as parents is benevolence [ren]. Respecting one's elders is righteousness [yi]. There is nothing else to do but extend these to the world (Mencius 7A:15. See also 7B:31). In this way, the Mencian path of moral cultivation becomes an exercise in extending "the reactions from the paradigmatic cases where we already have them to the relevantly similar cases where we do not yet have them but ought to" (van Norden, 112). By consciously and thoughtfully doing this, anyone is able to develop the moral excellence that they are born with. The way according to which the people conduct their lives is this: If they have a secure livelihood, they will have a secure mind. And if they have no secure livelihood, they will not have a secure mind. And if they have no secure mind, there is nothing they will not do in the way of self-abandonment, moral deflection, depravity, and wild license. When they fall into crime, to pursue and punish them is to entrap them. How can such a thing as entrapping the people be allowed under the rule of a man of humanity [ren]? (Mencius 3A1, translated in Chan, 67). An enlightened ruler, in regulating the people's livelihood, must ensure that it is sufficient, on the one hand, to serve one's father and mother, and on the other hand, to nurture wife and children. In good years, one is always full. In years of famine, one escapes death. Only when the people have a regulated livelihood do they rush toward the good, and thus people follow the ruler easily (Mencius, 1A7). Such convictions were instrumental in the development of Mencius's practical philosophy. The Mencian concern with moral cultivation and his confidence in the inherent goodness of people provided a strong impetus towards engaged scholarship. His convictions led to his belief that it was imperative for a scholar-official, like himself, to use his learning for the benefit of all people (from the ruling classes to the peasantry). As such, much of his thought and teaching centered upon fairly practical matters, including the need for proper governance, education and even land reforms. Mencius spent the greater part of his life attempting to convince various political leaders to enact these forward-thinking proposals. Due to the malleability of human nature, Mencius viewed proper governance as necessary for the moral advancement of the nation. Specifically, he thought that a ruler who acknowledged the innate kindness (ren) of his subjects would inherently draw the support of the people and would allow them to behave properly (following the rules of ritual propriety). [King] Xuan said, "What must one's Virtue [de] be like so that one can become a king?" Mengzi said, "One cares for the people and becomes a king. This is something that no one can stop." Suppose Your Majesty were to bestow benevolence [ren] in governing. This would cause all under Heaven who serve others to all want to take their place in Your Majesty's court, those who plough to all want to plough in Your Majesty's uncultivated fields, merchants to all want to place their goods in Your Majesty's markets, those who travel to all wish to use Your Majesty's roads. All under Heaven who wish to complain of their rulers would all desire to report to Your Majesty. If it were like this, who could stop it?" (Mencius, 1A7). In the above example, Mencius reproaches King Xuan for his failure to exercise benevolence in his leadership, a failure that was entirely within the King's ability to remedy. Further, he concludes the passage quoted above with viable suggestions (including offering public classes in animal husbandry and giving the people access to silk-producing moths) that would have appreciably improved the lives of the commoners, demonstrating his belief that this benevolent leadership was both practical and practicable. Mencius thought that non-benevolent leadership produced an environment where personal moral cultivation was impossible. He was so commited to this proposition that he argued that it was acceptable for the populace to depose a tyrant who ignored the people's needs. Given his general commitment to the Confucian Five Relationships, such a teaching becomes additionally revolutionary, as it argues that a ruler who does not behave appropriately actually ceases to be a ruler. This idea paves the way for later debates about the reciprocal nature of the Confucian relationships. Just as the Mencian emphasis on human malleability necessitated that the proper environment be created by benevolent leadership, so too did it emphasize the necessity of proper education. He argues that "it is the way of people that if they are full of food, have warm clothes, and live in comfort, but are without instruction, then they come close to being animals. Sage-king Shun was anxious about this too, so he instructed Xie to be Minister of Instruction, and instruct them about human relations" (Mencius, 3A:4. See also 1A:7). The (fairly blatant) subtext here is that any ruler should share this concern, and should do everything in his/her power to make such an education available for their subjects. This emphasis is also preserved in the idiomatic Chinese phrase 孟母三遷 (mèng mǔ sān qiān), which literally translated reads: "Mencius' mother, three moves." It refers to the legend that Mencius' mother moved their house three times—from beside a cemetery, to beside a marketplace, and finally beside a school—before finding a location that she felt was suitable for his up-bringing. As an expression, the idiom refers to the importance of a proper environment in raising children. Finally, Mencius spoke frequently and highly of the "well-field system," a land reform plan that he thought would help provide for all members of the community and to foster a spirit of co-operation. More specifically, this system involved dividing a square plot of land into nine equal-sized squares, with the eight on the outside being privately owned and the one in the center belonging equally to each of the eight families. In farming this land, the peasants would first cooperate on their shared field, and, when work on it was complete, attend to their own plots. Defending the merits of such a scheme, Mencius argued that "in the fields of a district, those who belong to the same nine squares will render friendly service to one another in their going out an coming in, aid one another in keeping watch, and sustain one another in sickness. In this way, the people live in affection and harmony" (Mencius 3A:3, quoted in Chan, 68). This example is most interesting for providing a concrete instance of a practice that Mencius figured could "extend the good" in the real world. Though Mencius considered himself to be a failure due to his inability to find an official patron to fully enact his political reforms, he has become one of the most influential figures in Chinese history. His impact on Chinese life and society has been second only to that of Confucius, as he was responsible for expanding and systematizing the teachings of his sagely idol. Indeed, the Mencian interpretation of Confucianism has generally been considered orthodoxy by subsequent Chinese philosophers, especially the Neo-Confucians of the Song dynasty. Specifically, Han Yu singled him out as the only classical era philosopher to correctly transmit the Confucian Dao, a view that was universally accepted among the Neo-Confucians. This public approbation reached its apex when Zhu Xi officially canonized his work as one of the Four Books, making it part of the official curriculum for Confucian education. Subsequently, Mencian ideas were central to the Neo-Confucian formulations of Wang Yang-ming, Muro Kyuso and Ogyu Sorai. Many modern Confucians (including Kang Youwei, Xiong Shili and Xu Fuguan) see the Mencius as a means of addressing the Western challenges of democracy and human rights from within the classical Chinese corpus. Indeed, the Mencian doctrines of innate human goodness, of the malleability of human nature, and of the people's right to revolution continue to be intriguing and challenging, and are compatible with many of the beliefs of modern Western humanities and social sciences. ↑ It is believed that the birthplace of Mencius corresponds with the modern county-level city of Zoucheng (邹城市) in Shandong province. ↑ These various concepts had to wait until the Buddhist, Neo-Daoist, and Neo-Confucian periods to become elaborated into a full-fledged metaphysical system. ↑ This is why Mencius states that "all things of the same kind are similar to one another…. The sage and I are the same in kind" (Mencius 6A:7, quoted in Chan, 55). ↑ The term well-field derives from the "tic-tac-toe board" shape of each of the proposed fields, a shape that is shared by the Chinese character for a well (jing, 井) (see van Norden, 127 ff 31). Chan, Wing-tsit. "Idealistic Confucianism: Mencius. A Source Book in Chinese Philosophy. Princeton, NJ: Princeton University Press, 1963. 49-83. This page was last modified on 17 September 2018, at 21:00.